On the heels of the success of recently launched - and sold out - limited-edition customisations of Jeep Wrangler, this new special model sports a unique trim level dedicated to all those enthusiasts searching for adventure and absolute performance in extreme driving conditions. Featuring exclusive styling cues, 18" Gloss Black alloy wheels, body-colour hardtop and original Mopar® accessories, the new Jeep Wrangler Polar will be available in Europe in the first quarter of 2014, in both two- and four-door versions, powered by the brilliant 2.8-litre turbo diesel. 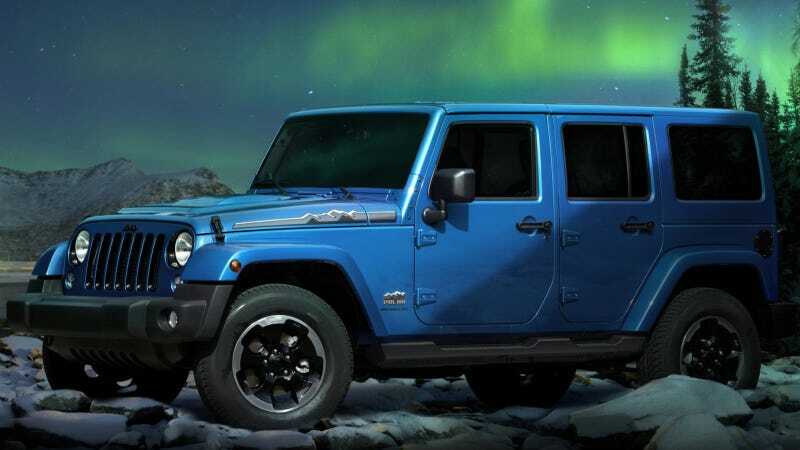 Jeep Wrangler Polar takes its cue from the severe climate and extreme conditions that characterise the Antarctic region. The "Polar" badge located on the vehicle's side shows off the 78° S and 106° E coordinates that correspond to the location of Vostok in Antarctica: the exact point where the absolute severest temperature in the world was recorded at -89.2° C (-128.56° F). The interior features Black leather seats enhanced by Pearl White accent stitching and "Polar" logo embroidered on the upper portion of the backrests. Standard equipment also includes heated front seats and a black leather-wrapped steering wheel with Pearl White stitching and high-gloss Ceramic White painted bezels. Pearl White accent stitching is found also on the armrests and floor console lid. The passenger-side dashboard grab bar and dashboard vent rings are finished in high-gloss Ceramic White to create the contrasting effect of the light on Antarctic glaciers. The exclusive cabin of the Jeep Wrangler Polar special edition also features an all-new cluster overlay with rings painted high-gloss Ceramic White and surrounding a blue instrument background with "Polar" logo. Mopar tread-pattern slush mats complete the interior appointments of the new Wrangler Polar. The new limited-edition model will be powered by the efficient 2.8-litre turbo diesel engine matched to an automatic transmission. The 2.8-litre CRD engine delivers 200 hp (147 kW) of power at 3,600 rpm and 460 Nm of torque at 1,600 - 2,600 rpm when paired to the five-speed automatic transmission. With a 52 cm longer wheelbase and a larger cabin that can comfortably accommodate five passengers, Jeep Wrangler 4-Door is the evolution of the classic Wrangler. Jeep Wrangler 4-Door combines the exceptional Jeep off-road capabilities with the comfort and versatility of an everyday car, turning the off-road champion into a four-door 4x4 convertible.